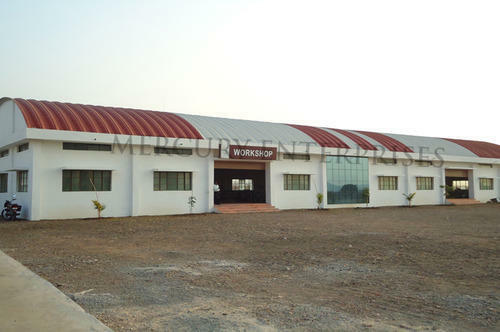 Leading Manufacturer of self supported wide span roof from Pune. We have complete allegiance in manufacturing wide endowment of Self Supported Wide Span Roof. Our fabricated products are used to cover the structure without any use of supports, hence giving non hindering clear span. Owing to this design, our products are widely used in industries for effective movement and material handling. These products are made by using quality materials, thus making them durable and rust free. thus offering economy in both, time and energy. This innovative technology makes our product needless of any ongoing efforts towards maintenance, thus completely eliminating the need for constant safeguarding. Our technology is full-proof against water seepage and extreme weather conditions. This leads to enhanced protection to goods & machinery stored in your facility, thus substantially reducing the costs related to product failure, rejection or damage. calamities like fire, earthquakes or hurricanes. Something which none other roof can yet achieve, we work with an incredible fabrication and installation speed of covering over 1000 sq mts of area in just 12 hours. This extraordinary operational speed proves to be an excellent application, especially in time-bound construction projects where timely implementation holds critical importance! Looking for “Self Supported Wide Span Roof”?